«©NCSX» Saber's been on a tear recently with a bevy of figures being released and announced in quick succession. 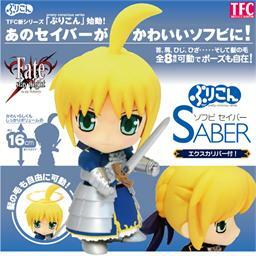 The latest Saber rendition squishes the blonde knight into the body of a toddler with stubby arms and a squat stature. Although Saber still carries Excalibur in her right hand, she's no longer imposing or threatening in her latest turn - she's just a punk kid with a toy sword. The Pretty Conscious Series (Purikon) version of Saber from Taki Corporation is made of soft vinyl and features eight points of articulation so her arms, legs, and even the sprig of hair atop her head can move freely. 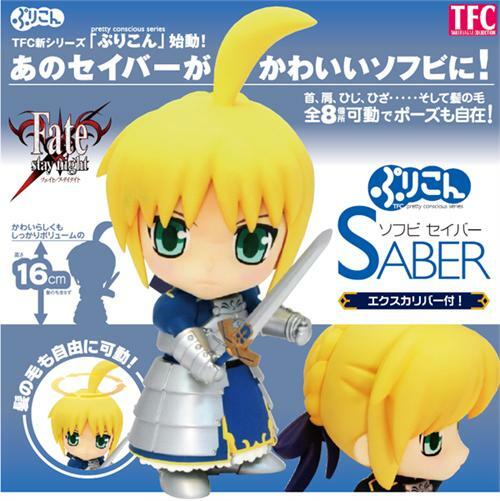 The figure measures 16cm (6.29") tall without the hair but if you count the hair, Saber stands 20cm tall. Alter's interpretation of Saber of Fate Stay Night fame gets her out of the blue suit of armor and into a frilly maid's outfit. Japanese manufacturer Gift has started preorders for a visually striking Saber figure which is dressed in a poofy dress and shining armor. The recent Fate/Unlimited Codes fighting game for the PS2 was a solid seller and NCS shifted a good number of the SP-BOX Edition which included a bonus Saber Lily Figma from Max Factory. In the Fate/Tiger Colosseum game, the cast of Fate/Stay Night is shrunken, deformed, and shifted into toddler-like versions of themselves.